Looks like a tank from TRON. Cable length is approx 10 feet. D-Pad is a four-sided cross. Ugh, like the TRON PS3 controller this is a wired controller. It’s wired. Not wireless, wired. Really? Yes. Welcome to the 21st century. Not. Large green Xbox button doesn’t really fit the color scheme. We’re not sure why PDP decided to take the wired approach to the PS3 and Xbox 360 TRON: Legacy Collector’s Edition controllers. 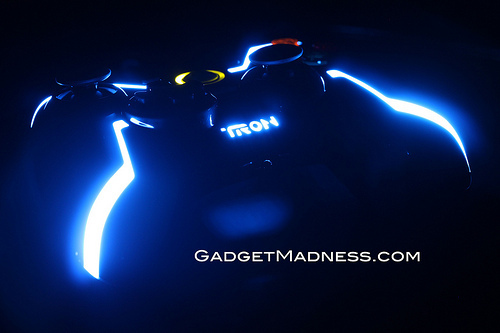 This special edition TRON Xbox 360 USB controller is recommended for collectors and those who don’t mind wired controllers, but sadly just isn’t as cool as the TRON Wii remote controller, which is wireless. One positive note to the TRON 360 controller – it can be used on your PC and is compatible with Windows games that support the Xbox 360 controller! The reason these are wired is because if they weren’t, the battery would be drained like 6 times faster as those lights would chew through power from a battery faster.